One day in 1939, a young kid residing near Allentown, PA picked out his copy of Detective #27 over all other comics that month. He brought it home, fell in love with Batman, and carefully placed the comic away for safekeeping. Little did he know that out of the hundreds of thousands of copies printed of Batman's debut, this boy's copy would end up being the most perfectly preserved in the world. The same was true for many of the other 135 comics he happened to save over the decades. Jim Payette and Stephen Fishler were the lucky dealers who eventually bought the Allentown Collection in 1987. It made a huge splash in the comic world, as several Allentowns ousted many copies that were thought to be the highest grade in existence, including several of the Mile High issues. Out of the 45 pedigrees, Allentowns rank in the top 5 for overall grades. Highlights from the collection include Batman #1-#6, Detective #26-#48, Mystery Men #1-#16 and Wonderworld #1-#17. A comic book dealer is constantly wondering when and where the next "great collection" will come along, and if he'll be the one to nab it. During the fall of 1996, Dennis Grimm's winning ticket walked through the door of his Castaway Comics store in Aurora, Colorado in the form of a kid carrying a bag full of comics. This was the first of several bags that eventually accumulated into a vast collection of Atomic Age comics now known as the Aurora Collection. Eventually Bill Hughes, a well-known dealer who recognized how rare the books were, bought and marketed many of them to a national audience. This led to the collection's name and status that it holds today. 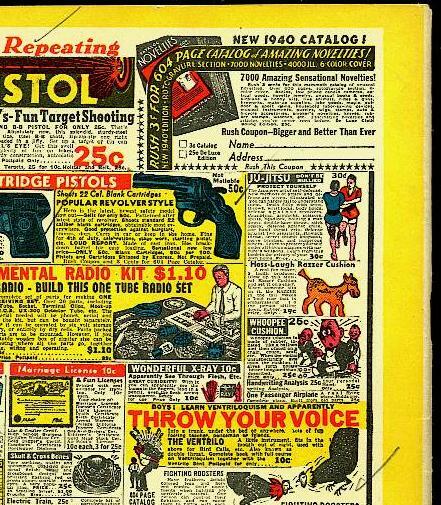 As astute collectors of 1950s comics know, the extra cheap paper stock and production methods of the decade have made it nearly impossible to find high grade Atomic Age books. So it's no surprise that a debut of 2000 fresh, high grade original owner comics from this period would make a significant impact on the comic community. Besides grade, another attractive feature of the Auroras is their cover markings, similar to the later Mile High copies. Both originated from the same regional distributor in the Denver area. In 1990, Joe Rainone was approached by a man at a convention who said he had a huge collection of comics for sell if he could come up with $30,000. Joe talked it over with his partner Phil Weiss, who where both initially apprehensive until the man had explained he was an attorney helping liquidate the estate of one Stanley Pachon in Bethlehem, PA. An appointment was scheduled. The first meeting yielded 4000 comics for $11,000. Knowing there were many more comics to be bought, Joe and Phil were promised first shot. After a nail-biting month, the two were led to a hoard of 14,000 comics in Pachon's house (where the police outline of his body was still on the living room floor; Stanley had suffered a brain hemorrhage). For $20,000 more, the partners were now in full possession of what they would name the Bethlehem collection. The size of the Bethlehem collection is matched only by the Edgar Church/Mile High Collection, but the Bethlehems started late (1950) and stretched well into the Silver Age, with multiple copies of many issues. The famous E.J. Kery Kodak-Film-Magazine-Shop stamp on many of their back covers happens to be one the most recognized pedigree marks of all. Even though 700 Bethlehems have been graded by CGC, it's only a fraction of what's still out there. Bethlehems often do not get credit for the impact they made in the early 1990s. It was the the Bethlehems and White Mountains that eventually convinced collectors that a pedigree can contain Silver Age comics as well. The Big Apple pedigree is unique in a few ways; Its span is huge, starting in 1939 and continuing all the way to the end of the Silver Age. It was assembled by an African-American named James Hilton, and the breakdown of books and page quality reveals some very peculiar traits. Although Hilton died in 1968, it was not until 1993 that his nephew Ron visited the old family home in Brooklyn and discovered the first of many storage places where his uncle kept his huge comic collection. Afterwards, Ron ventured into Manhattan with a case full of his uncle's comics, and paid a visit to Christie's Auction House. At the time was Phil Weiss was assisting Joe and Nadia Mannarino as they prepared for the 1994 Christie's Comic Auction. Upon reviewing Ron's beautiful group of books, Phil quickly consigned them to the auction. A six year relationship was begun with the nephew, ending with the last Christie's auction in 2000. But only a fraction of Hilton's 5000+ comics were sold during this time. The most unique aspect of the Big Apple Collection is the vast difference between its Golden and Silver Age copies. The Golden Age issues contain some of the highest graded comics exhibiting white pages, which ranks them in the top ten for 1940s collections. However, the '40s books had been stored in a trunk for decades while the rest of the books were stacked on open shelves after Hilton passed away. The separate storage resulted in the largest swing of page quality, landing the Silver Age portion of the collection dead last on list. Although there are Big Apples that go as far back as 1939, every significant Golden Age book in the collection comes from one year, 1946. Every other year during the '40s contains only a handful of issues, except for 1949. For some strange reason, not a single Big Apple has ever been located from 1949, which coincidentally is the year Ron was born in the same house his uncle resided. This collection is one that was likely broken up and sold too quickly to be given recognition in the comic market as a pedigree. Acquired in 1997 by dealer Rick Semowich, the books came from the original owner in Cape Cod, MA who was looking for the best price he could get for the entire collection. Rick was the winner. The collection contained 889 comics from 1945 to 1950 with many different genres (though the primary were superhero and crime). Most titles had spotty numbers of issues present and almost no significant runs to speak of. Cape Cods are very clean with good page quality. They mainly grade 8.0 or higher with many topping the CGC census for particular issues. Because Rick sold more than half the books to one buyer soon after purchasing the collection, the books were not permitted a normal introduction like most pedigree collections have seen. If not for the instantly recognizable "ND" code found on the covers of most issues, this collection would have slipped into oblivion. One of four Golden Age pedigrees to contain all #1 issues, the Carson City collection surfaced out of Nevada during the ‘90s, after surviving storage inside two shacks full of newspapers and periodicals for half a century. The seller was an elderly woman, who was liquidating the contents of the shacks after the passage of her pack-rat husband, who had squirreled away a copy of practically every periodical that passed through the doors of his tobacco and candy store during the ‘40s and ‘50s. Stored in between newspapers, the comics were in immaculate condition with near white pages. Mark Wilson had purchased the first batch offered for sale, and gave the woman a copy of the Gerber Photo-Journals as a gift. When she found out the author of those books, Ernie Gerber, lived only 30 miles away, she contacted him when she was ready to sell the second batch (so much for loyalty!). Ultimately the collection yielded an impressive number of premiere issues, including Marvel Comics #1, All Select #1, Mystery Men #1, and reportedly the best existing copy of 1939 New York World's Fair. When Brian Peets bought the Central Valley collection, he did something most dealers never do. He held onto it. He didn't sell a single copy for 13 years, deciding to enjoy the collection in its entirety as he realized that such a find usually comes around only once in a lifetime. And what a collection it was, containing some of the nicest early Superman and Batman issues in existence. It also stands out as one of the few pedigree collections that have been almost entirely CGC graded and sold through the internet. In terms of quality, the Central Valleys exhibit a freshness rarely found among it's contemporaries. Comparisons have been made to the San Franciscos, the Larsons, and yes, even the Mile High collection. The greatest attribute of these books are their blinding white pages, ranking them #2 on our Page Quality Score, which beats out all three of the afore mentioned pedigrees. Even though Brain was unable to ascertain the history of the Central Valley's origin, it's assumed the books have spent their entire life (until last year) in the northern part of California--the same birthplace as the Okajimas and Palo Altos, other collections famous for their superb page quality. One of the oldest pedigrees discovered, and seldom offered for sale in the open market. Most of the best known Chicago comics were in the collection of George Olshevsky, one of the all-time greatest fans and historians of Timely comic books. He had cherry-picked all of the Timelys from the complete collection when Joe Sarno bought it from the original owner in 1974. The comics had been kept in manila folders their whole life, but besides the Timelys George got, most of the other books were spread to the four winds with no special designation. Chicago copies rank quite high when compared to the other pedigrees; several are the highest graded copies on CGC's census, and they exhibit a natural feel that is not unlike books from the Edgar Church/Mile High collection. Nearly all of the Timely keys were present, as well as most of the low numbers of each title. George sold his Timely collection in 1988, which contained over 100 Chicagos. Before the sale he carefully wrote a code number, a condition code, and his initials in the margin of an interior page of each comic using ball point pen. All 409 comics contain this writing, but the Chicago copies can be told apart by their unique listing in George's catalog, each denoted with a NM+. In the summer of 2000, Steve Borock and Mark Haspel were setting up the CGC booth at San Diego Comic Con for the first time, having opened their doors just six months earlier. A dealer named Patrick Shaughnessy approached them with a sampling of amazing Golden Age comics from a collection he had recently acquired in Canada. Mark and Steve never forgot about the books, always wondering if and when they'd get the chance to see them again. It would take almost seven more years before they would be able to see Pat's collection in its entirety. 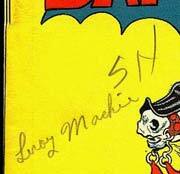 Consisting of over 1000 comics from the mid '40s to the mid '60s, many of the earliest books have an intriguing Chinese symbol on the covers, written in pen by their original owner named Toby. He had immigrated from China and learned to read English from comic books, buying American issues between 1944 and 1947 (the period when Canada was allowing American comic books to be sold. Canadian versions began in 1948). He must have been very careful with them as most survived in near perfect condition. By the mid 50s, his daughter took up his collecting habits and started adding to his stock with adventure and movie genre comics, which stretched into the 1960's. The collection therefore contains two distinct parts, but was kept together by the family. Many years later, after Toby passed away his daughter sold the collection to Pat. How often have you seen a Golden Age comic with a large "SN" written across the cover? They're peppered throughout the 1992 Overstreet Grading Guide, and turn up frequently in dealers' inventories. These books come from an enormous accumulation dubbed the Cookeville Collection. Named for its point of origin (Cookeville, Tennessee) the collection was acquired in the 1990's by Steve Geppi, who integrated copies he needed into his personal collection and placed the rest in the Diamond Gallery stock. Cookevilles are very easy to recognize because of the "SN" mark. Sometimes the owner's name, Leroy Mackie can be found on the cover as well. The Cookeville collection runs the gamut of nearly every genre, totalling about 2000 comics from the early 1940s to the early 1950s. The second earliest collection recognized as a pedigree, Cosmic Aeroplanes are famous for their distinct markings. Discovered in Salt Lake City, Utah in 1972, the collection was raided by a few collectors before being sold to David Faggiola, owner of the Cosmic Aeroplane Bookstore (hence the name). The books were subsequently and anonymously liquidated into the market. The collection was amassed by an art teacher during the ’40s and ‘50s to be used for demonstrative purposes for students. 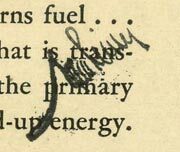 This is evident by the numerous checkmarks and notations written in pencil on the margins of each page, or on the cover. Because the collection had been assimilated long before the pedigree concept took hold, there are many unidentified in the market. Collectors enjoy the rush of discovering "lost" copies from the collection, an emotion similarly experienced by fans of the San Francisco, Okajima and Recil Macon pedigrees. There is no way of knowing the true size of the Cosmic Aeroplane collection, but it's rumored to be somewhere between 2,000 and 3,000. It yielded some big key issues like Adventure #40, Flash #1, and the Showcase #4 pictured on the cover of the 1992 Overstreet Grading Guide. The average grade of the collection is a bit lower than that of its fellow pedigrees, but the rumored size, presence of big keys, and easy identification has allowed the collection's legacy to prevail over the years. Of the Golden Age collections, this one is second only in size to the extraordinary Edgar Church/Mile High accumulation, numbering roughly 13,000. Even though it lacks many of the key issues and rare ‘30s books that were present in the Mile Highs, the Crippen collection still contains full, unbroken runs of titles from every company and genre between 1940 and 1955. It also has a distinctive history of discovery; they first surfaced in 1991 when 2,000 Crippen books, called "D" copies at the time, were brought to market. Fifteen years later, when the family decided to sell the collection after Davis Crippen passed away, the remaining 11,000 comics went up for auction. Once the Crippen family found out about the missing books, the story was picked up by a reporter at the Wall Street Journal who was determined to find out the true story. Did Davis Crippen sell them himself? Or were they stolen? Structurally, the Crippen books are as nice as many of their pedigree contemporaries. Virtually unread, each book exhibits perfect corners and spines, and rich colors. Their main detractor is foxing, caused by prolonged storage, and subsequent exposure to heat and moisture in an unprotected garage for several years. Ironically, the move to the garage took place after the theft in 1991. Although he didn't keep 12 copies as Bill Gaines did with his ECs, William Crowley still managed to sock away two copies of nearly every Fawcett produced during his tenure as editor. In addition to the runs of Captain Marvel, Whiz (three #2(1) copies! ), Master and Wow, the collection also contained several classic non-Fawcett comics, including Timelys, Superman and Batman titles, and many esoteric comics high on collectors' want lists. Being a newer collection to surface in the past seven years, and because it contains many high grade books, a large portion of the Crowley collection has been CGC certified. In fact, only the Mile High collection has more books in holders, with Crippens close behind. Crowleys also rank 2nd on our list of the highest graded '50s comics with a median grade of almost 9.4, although the page quality is not as high as its counterparts. This collection could be one of the first ever amassed for speculative reasons. We say that tongue -in-cheek because no one during the '40s knew comics would eventually be collector's items. But consider the facts; the comics were discovered in the estate of a woman who used to run a newsstand, all the books were #1 issues, and each comic was near perfectly preserved. It sounds like a modern-day comic investor in action! Although the collection is only 153 comics, the Denver collection contained only number one issues from 1938 to 1944, including powerhouse keys like All-Select #1, Green Lantern #1, and Sensation #1. The collection represented a very large number of publishers, 39 in all. The most dominant genres are superhero and adventure, which make up 86% of the total. Astonishingly, almost 40% of the Denvers are the highest graded copy on CGC's census--nearly 90% in the top three. Given the abundance of pedigree accumulations that contain many key issues represented in the Denver collection, it's incredible almost half of the Denver books are the best in the world. The most remarkable collection of vintage comic books ever discovered. The Mile High's immense size and extraordinary grade influenced a major shift in both price structures and the comic book grading standard itself. It is the benchmark against which all other collections are compared. This took years to happen after the collection was discovered in 1977. The hobby went through the classic stages of emotional change--denial, anger/fear, reluctant acceptance, finally moving on to the future. For those who had not seen the books, denial was easy. It's difficult to believe in something better then that which previously existed, especially without witnessing it. This emotion carried over for many years, going well into the ‘80s before collectors realized how amazing the books really were. The fact that very few Mile High copies ever made it to the open market that decade only compounded collectors’ denial. The anger arose when Chuck Rozanski, purchaser of the collection, began asking multiples of guide for each book, a concept that was unheard of at the time. This was fueled by collectors’ denial that Mile Highs were indeed worth the extra money. Ironically Chuck sidestepped the fear factor by asking these multiples; had he priced the Mile Highs at straight guide, the flood of books would have instantly devalued the Golden Age market, considering most other books were clearly inferior by comparison. Acceptance in the market was somewhat manipulated the first years, as those in the know preferred to keep the Mile High collection a secret for their own benefit. Even though it took nearly 10 years for Chuck to sell the entire collection, it was about that time when the average collector began to understand their potential. Today, given the accelerated speed of information via the internet and the laser focus on grading (and of course hindsight), such an event would certainly assimilate at a much quicker rate. The community completely embraced the potency of Mile Highs and the pedigree notion as a whole by the ‘90s. An explosion of "Pedigree" collections littered the market, with each owner hoping to make his mark, as well as make some money. It seemed as if one was granted a license to charge over guide by giving a decent group of books a name and a story. The struggle to establish guidelines as to what constitutes a pedigreed collection continues. CGC's presence in the marketplace has concentrated collector interest on individual grades, which has shifted focus away from viewing the merits of a collection as a whole. Blanket multiples have given way to multiples based on individual grades, regardless of the collection. Mile Highs remain one of the few exception though, still bringing 2x to 5x guide (and up) for copies in any grade. There are other pedigree collections that average higher grades or have whiter pages. But in total the size, scope, grade and value of the Edgar Church/Mile High collection is vastly unparalleled. If reassembled, the estimated value would be greater than the next five biggest collections combined. Many wonder if another accumulation of equal or greater quality will ever surface, and if so, what effect it would have on the hobby. Over the years, many collections have surfaced labeled as "File Copies". File copies can come from the publisher (Harvey, Random House, Poughkeepsie) or from professionals in the field (Lloyd Jacquet, William Gaines, William Crowley, Walter Gibson, Harvey Kurtzman, Stan Lee and others). The publisher file copies are usually classified as warehouse finds because they can contain multiple copies of many issues in high grade. These are generally unread copies, but sometimes lack high page quality. Most have no distinct markings, but some have editorial or printing type notes. The accumulations of professionals tend to garner a pedigree status with collectors, as they usually have more uniqueness and character to them; the notes present on the Lloyd Jacquet copies of Marvel Comics #1 and Motion Picture Funnies Weekly #1 shed new light on the age-old debate over which comic the Sub-Mariner first appeared in. Sometimes books in these collections are not in the highest of grades because of improper storage, or because they were used by their owner as reference material. Others, like the Gaines collection, are immaculate. The Gaines pedigree is unique because it was amassed by the very creator of the comics contained within that collection. While some may think the Gaines books should be classified under the "file copy" status, there is a uniqueness to the collection. For one, the average grade of the collection is unparalleled, landing #1 on our overall list of CGC graded copies. Second, Bill Gaines didn't save just one, two, or even three copies of each comic. He socked away a shocking twelve copies of nearly every issue EC published between the years 1950 and 1955. Include their massive popularity and far-reaching influence in both the evolution of comics as an art form and the birth of comics fandom, and it goes without saying that collectors place these books in the stratosphere of collecting. The comics sat in Gaines’ closet for decades, each carefully wrapped in brown paper until one day in the early ‘90s when he decided to unveil the collection with the help of Bob Overstreet and Russ Cochran. Ironically, Gaines had saved only one single copy of Vault of Horror #12, the issue credited with the birth of EC's New Trend, and the most valuable horror comic of all time. As in life, Gaines’ timing was impeccable even in death, as he passed away a mere year after releasing the books to the public. Even though his collection was limited to only EC-published comics, there is no shortage of love from collectors. Even if there are 12 copies of each issue! One of the few collections to be almost completely CGC graded and sold at once, the Harold Curtis collection is a classic representation of Golden Age Superhero comics. It numbered exactly 519 books (about half the size of the Lamont Larson collection) and spanned over a decade, starting in 1940 and peaking during the years 1941-1946. The focus is predominantly superhero (80%) and predominantly DC (62%). In fact, there are only eight total publishers represented, one of the fewest covered in our pedigree book. There are some glaring omissions, though. The collection is void of any titles beginning with the letters E through O. Popular titles like Flash, Green Lantern, Hit, Military, National and many others that would normally be found in a collection of such depth…are simply not there. Other strange absences are Superman, the flagship character of Curtis's beloved publisher DC, and any titles published by Timely. Over 65% of the collection exhibits identifying marks, the most obvious being Harold Curtis's name boldly written in pen. Other markings include arrival dates and distributor letters, so if there are more Curtis books to be "discovered," finding them in the future is a distinct possibility--and a challenging proposition for completists. Even though it's impossible for two pedigreed collections to exactly resemble one another in look, feel and smell, the Hawkeyes do in fact come very close to passing for Mile Highs. The sharp corners, whiteness and freshness of a Hawkeye are just as amazing, with only the telltale odor of mothballs setting them apart. They rank in the top 10 both in median grades and page qualities, and contain many of the best existing key issues like Superboy #1, All-Star #3, More Fun #101, and Captain Marvel Adventures #1. Hawkeyes brokered by a dealer named Leroy Harper in Mason City, Iowa. He placed an ad in the Comic Buyer's Guide in 1984, and quickly got enthusiastic responses from both Joe Smejkal in Texas and Mike Tekal in Iowa, two prominent collectors. The discovery of the Hawkeyes changed Joe Smejkal's life. He got so addicted he was spending all of his available cash with Leroy as the books became available. Like any good dealer, Leroy provided Joe first shot at each batch, which was coming like clockwork every Saturday for one year. By the time it was all done, Joe had accumulated over 300 of the nearly 1500 Hawkeyes Leroy sold. Years later, Joe would purchase several hundred Hawkeye westerns from another collector who had obtained them in a separate deal. Originally reported by the local media as a $100,000 garage sale, the Henschel Collection made local and national news when the first of two parts of the collection were sold by the Swenson Auction House in Wichita, Kansas in April 2004. The comics were found by Irene Henschel under the box springs of her own bed. They belonged to her late husband Robert Ford, who had passed away in 1999. Irene was not aware of the value of the books and was shocked to find out she was literally sleeping on a goldmine for years! The auction house did not use traditional venues of advertisement within the comic community. Luckily an astute collector found the auction online and posted it on the burgeoning CGC message boards where word quickly spread. Several prominent dealers attended the first auction, which contained 121 raw comics and netted $130,000. By the next auction in September, the second batch of comics had been graded by CGC, and grossed $190,000. 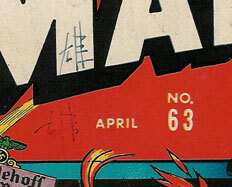 Comics in the Henschel Collection ran from 1938 to 1943 and included a Flash #1 in 6.5, Captain Marvel #1 and Superman #1. Steve Geppi was the top bidder in both auctions. Although the average grades rank lower on our list, Henschel page quality is exceptional, landing just ahead of Larson in the top 10. Unknown by many, the Kansas City Collection is the oldest collection considered a pedigree. Purchased by the Thompsons in Kansas City in the late 1960s, this collection predates both the Cosmic Aeroplane and Larson pedigrees by half a decade. Though not classified as a bonifide pedigree by the comic community until nearly twenty years after its debut, the size and content of the Kansas City Collection was never realized until now. It's one of four pedigrees consisting of #1 issues, although the number of valuable keys within this collection outstrip the other three. Along with the Mile High and Larson, the Kansas City is only other pedigree that is known to contain an Action #1. The rest of the collection has more #1 issues between 1939 and 1943 than the Mile High Collection! Longtime collectors and dealers have known about the Thompsons and the Kansas City collection for 25 years, as they would bring out only a handful of issues for sale each year. It's the main reason no one has ever been able to assess the totality of this collection. The original list was obtained for the pedigree book, but unfortunately there are no identifying marks on the Kansas City books. Many have vanished into collections over the years. One of the great things about the Larson collection is the depth of rarity. The genesis was 1936, a mere three years after comics began in their current form. It contains many of the toughest comics known today, and ranks third in scarcity. For several years, those familiar with the books have suggested they rank as the third best Golden Age pedigree overall. The many key issues that are present certainly support such a notion; only three of these 45 pedigreed collections contain an Action #1, and Larson is one of them. One of only three collections that represent a significant portion of the ultra-rare 1930's period of comic books (the other two being Lamont Larson and Mile High). Since both of those collections were discovered in the 1970's, it had been nearly 30 years since the hobby had seen such a substantial unearthing of rare, high grade pre-hero comics belonging to one owner. The Lost Valleys rank second overall in terms of scarcity, thanks to near-full runs of Detective #1-27, More Fun, Adventure, Famous Funnies, and ultra-rare titles like Wow and Funny Pages. Because it surfaced in 2003, the Lost Valleys were one of the first collections pedigreed by CGC. The collection was amassed by a cryptographer in the Army Air Corps during WW II. Unlike most kids, he didn't stop reading comics when he reached a pubescent age, continuing to buy on and off for many years...even during the '90s! Al Stoltz and Jeff Weaver, who together bought the collection after the family sold a few books on eBay, even found a hoard of old CBG's among the hundreds of comics, strips and big little books. The original owner had clearly kept up with the hobby over the years. When a pair of brothers in Napa Valley, CA were prepared to sell a comic collection they acquired in 2003, nearby comic shops were contacted. Lee Hester of Lee's Comics (who also found the Palo Alto Collection) was one of them. Lee spent time grading the collection of 363 books and was impressed with the quality, especially since they came from such a notoriously tough period for high grade comics (late 40s to early 50s). Over half of the collection consisted of sparse runs of DC and Fawcett superhero titles. Many Dell humor books such as Four Color and WDC&S were present as well. Although it lacked key issues, many Napa Valley Actions, Batmans, Detectives and Supermans top the CGC census today (ranging in grades from 7.0 to 9.4) and sell well over guide due to their scarcity in high grade. The brothers chose Josh Nathanson at ComicLink to auction their books. Only 100 of the comics were CGC graded for the auction, but sales were brisk across the board and several record prices were realized. Though not recognized as a pedigree by CGC, most Napa Valleys were documented when sold and should retain their providence by the original purchaser. They have no cover markings though, and would not be easy to authenticate otherwise. One of the few collections here that are not recognized by CGC as a pedigree, New Hampshire represents the glorious western genre of the late ‘40s and ‘50s. It contained 1200-1400 comics, more western comics than any other collection--save the Mile Highs. Thanks to their easy recognition via penciled arrival dates, these books can be readily identified. The collection was bought by Jim Payette, who was also involved in the purchase of the Allentown, Denver, and Nova Scotia pedigrees. He did actually name the collection when he sold it, and even noted each copy in his catalogue with "NH." Even though they never obtained official status as a pedigreed collection from CGC, the vast representation, high grades and identifiable traits lands the New Hampshires on our list. If one ever wonders how useful an Overstreet ad can be for finding new material, they only have to talk to David Anderson in Virginia. In 1990 Anderson agreed to buy Bob Overstreet's Mile High copy of All-Star #3, but only if he could also find a suitable replacement. This was not going to be an easy feat as high grade copies of #3 are quite rare. To aid Dave in his quest, Bob offered him a free full page ad in the 1991 Overstreet Price Guide. Within a few months after publication, Dave received a letter from an elderly gentlemen on the West Coast, leading Dave to what he says was the best collection he had ever acquired first-hand up to that point...and for him that's saying a lot. The Northern Cal Collection is possibly the least known of all 45 Golden Age pedigrees, yet contains books that would rival most of them. And the All-Star #3 in the collection? It was so nice, Dave kept it for himself. The copy was eventually graded 9.4 by CGC. Unlike the Golden Age and Silver Age, both dominated by the superhero, most pedigreed collections from the '50s are comprised of a variety of genres. The first half of the decade saw an explosion of titles as publishers began to target more mature audiences. It would be the comic book's zenith just before TV came along and stole away millions of entertainment seekers. As a result there is less consistency within '50s pedigrees, whose contents can cross over many genres, publishers and titles. The Northford collection is a rare case that wholly represents only one of these genres (horror), similar to the New Hampshire pedigree, which comprised only westerns. Found by Stephen Fishler and Vincent Zurzolo of Metropolis collectibles in 1999, the Northford collection contains the most complete run of pre-code horror comics of the 45 pedigrees featured here. 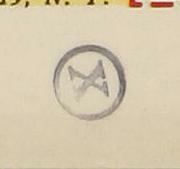 Each are instantly recognized by the characteristic stamp of an "x" within a circle, which is found on the back cover. The original owner apparently lived with a reclusive, neat-freak sister who was always trying to throw his comics away mom-style. She finally got her chance after his passing in the early '70s, but instead of being tossed in the garbage, the comics were left in a chest of drawers, which was sold to an antique dealer. The dealer held onto the comics for 30 years until finally selling them to Metropolis. As if he had not been involved in enough pedigrees in his lifetime, Jim Payette added another in 1994. Responding to a phone call from a Canadian auction house informing him of a collection that was to be auctioned the next day, Jim was the only major comic dealer in the country close enough to attend. 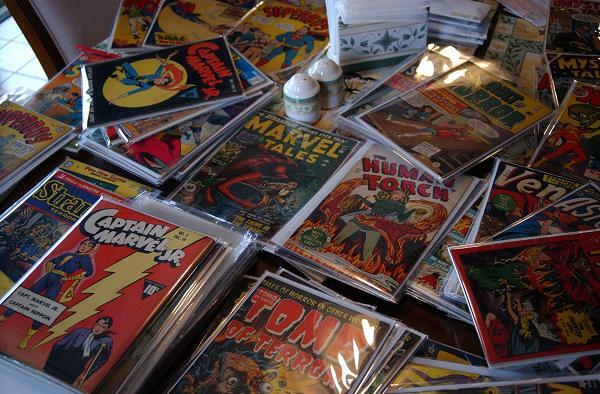 The auction planned to sell all 2000 comics from a woman's estate in one lot. Although no other U.S. dealer could attend on such short notice, Jim had competition from a Canadian dealer from Brunswick, who not only opened the bidding at $10,000, but drove Jim up to $85,000, which happened to be more than what the owner's house sold for earlier in the auction. There are two distinct portions that make up the Nova Scotia Collection. The first consists of mostly DC Golden Age from the late '30s to the early '40s. There are only around 70 issues in this portion, but they represent the best of the collection, as they contain the highest overall grades and best page quality. Included are such keys as Batman #1, Detective #31, #33, #35 and #38, and Superman #1-#3. The second part of the collection is over 1900 comics dating from the early '50s to the late '60s. These copies are lower in grade (averaging VF) and exhibit lesser page quality than their earlier counterparts. Both sections were found together in the estate, but the varied periods and quality of the comics suggest they may have been acquired by different collectors within the same household, similar to the Big Apple pedigree. It's rare to find a collector who remained an active buyer for decades, as most lose interest within a few years. Even Edgar Church and Davis Crippen, two of the biggest pedigree stalwarts, petered out after 15 years. This makes the Ohio collection special, as it runs unbroken for nearly 30 years-- from the Golden Age all the way into the 1970's. Only the Big Apple pedigree can boast such a span. Emerging from Akron, Ohio, this monster collection required two brokers and six years to bring out every issue. Dealer Nelson Dodds was ultimately responsible for introducing the Ohio collection to the comic market in 1994, but even he did not realize its size and quality until years later. Known for having great pages (ranking in the top 10) and easily identifiable distributor codes on the covers, Ohio books have been sought after by major pedigree collectors for over a decade. 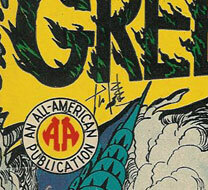 Though stocked with many high grade Silver Age issues, it's the Golden Age copies that made the Ohio collection famous. The Okajima Collection originated in the midst of one of the darker moments of American history. After the bombing of Pearl Harbor in December of 1941, the knee-jerk reaction of the U.S. Government was to deport all Japanese Nationals residing in the States, and then round up all U.S./Japanese citizens and place them in internment camps. It was at one of these interment camps that a young Japanese/American girl used the four color world of comics as a means to escape her prison surroundings. Many years later, after the collection had been stored away and forgotten by her family, the books were rediscovered at an estate sale. A price was set, and three lucky attendees walked away with one-third of the comics each, forever splitting apart what would become known as the Okajima Collection. Word quickly spread about the collection after copies made their way to those "in the know." Okajimas have established a reputation for their white pages, which many have attributed to the temperate climate of California. Such whiteness puts this collection far ahead of its many pedigreed peers, as it ranks 8th overall. There are still many copies from the Okajima collection anonymously floating around the hobby, waiting for sharp-eyed collectors to spot their easily identifiable markings. Most pedigreed collections were stored in one or two locations for decades, patiently waiting to be plucked by a lucky dealer. Rarely do old comic books survive a move, usually getting pitched in the garbage with other "junk" as the cleaning commences. But the Palo Alto collection, kept intact by two military men for some 45 years, likely traveled all around the world before landing in the lucky hands of Lee Hester. First stored in an airtight footlocker, and then in polybags, the books maintained their bright, glossy covers and near-white pages for decades. They never suffered the foxing, tanning or dust shadows associated with more common storage conditions. Palo Alto certificate and catalog cover (front and back). Over 50% of the CGC graded Palo Altos are the highest graded copies, and 20% are the only graded copies. This can be attributed to the collection's core originating from the '50s, a notoriously tough period for high grade comics. It's also the very first collection to be christened a pedigree by CGC shortly after they opened their doors in 2000. In 1981, while Steve Geppi was building his comic empire, one of his store managers uncovered a lead to a comic collection near Lancaster, Pennsylvania. The broker, named Birney, took him to an elderly lady's home where stacks of Golden Age comics were piled throughout a room. The room also happened to contain several children running around, carelessly bumping into the stacks. Steve actually witnessed the Detective #38 and All-Star #8 sustain damage by the kids. There were about 1,000 comics in the collection, primarily from the 1941-1944 period, and contained mostly superhero comics from just about every company publishing at the time. With a median grade near VF/NM 9.0, the Pennsylvania collection ranks in the top 25%. The bulk of the books have resided in Steve Geppi and Bob Overstreet's personal collections for over a decade before they began leaking into the market. A few years later Steve learned that there were more books in the collection, possibly held back from the original purchase. Steve bought these as well, using the entire collection as a stepping stone to build Diamond into the #1 distribution company for comics nationwide. And the store manager who uncovered the lead? None other than Al Stoltz, owner of Basement comics and co-owner of the Lost Valley Pedigree, another prominent collection featured here. Often mistaken for pedigreed collections, provenances can resemble them save one factor: they were accumulated second-hand, thus breaking one of the cardinal rules of pedigrees. Examples would be the Nicolas Cage Collection, the Olshevsky Collection, the Dallas Stephens Collection, and the Joe and Nadia Mannarino Collection. Usually they represent impressive, high grade runs of titles from he Golden or Silver Age, or the person who owns them is special in some way. Sometimes a provenance can contain pedigrees within it, as the Olshevsky collection did with the Chicago pedigree. The Nic Cage collection was assembled late enough to contain examples of many pedigrees, such as Mile High, Larson, and Rockford. Often referred to many as the "poor man's Larson" due to Recil Macon's name written in a similar fashion on the covers (and on average being lower in grade), most information on the Recil Macons has been passed around with little substantiation. Like Lamont Larson, Recil Macon is still living to answer questions, but questions still remain. His comics were sold off in two batches; the first was sold in 1990 by an unidentified individual who (like the Davis Crippen collection) had stolen books from Recil's home. The next batch were sold by Recil himself. Darren Wilson in Abilene, Texas was the primary broker for Recil, but it was Greg Buls who ultimately acquired about 300 of the books and advertised them on a national stage. It has been estimated that there are less than 1000 comics in the Recil Macon Collection. However, CGC has only graded 23--the smallest percentage of any of the 45 pedigreed collections here. There are many Timely books in the collection, which are highly sought after among collectors. Most issues are easy to identify with as Recil's name is usually written (multiple times!) on the cover and interior pages. One question for Recil--how did these comics manage such superb preservation in the holding cabinet of an outdoor shed in sun-scorched Texas? 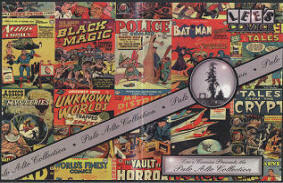 Primarily a collection of '50s comics that best represented the horror and sci-fi genres, it is rumored to have been as big as 4,000 books total, although this is impossible to confirm as the collection was distributed by more than one person, and many of the comics were not identified as a pedigree. The place of origin was Sacramento, CA, where a widow was selling her deceased husband's childhood comic collection. Brian Peets of A-! comics was lucky enough to be in on the initial offering of the collection, purchasing a large portion of the comics and then introducing them to dealers and collectors at the 1998 Wondercon convention. Having been stored in a shed during its tenure, the River City books tend to show signs of exposure to the elements, particularly in the pages and inside covers, although the colors and gloss remain brilliant. Most copies bear a grease pencil distributor mark on the cover, making it possible to locate orphaned River City pedigrees in the marketplace. One of the best Golden Age collections to surface during the 1990's, the Rockford pedigree is a solid representation of the '40s, and boasts many of the great key issues, some of which rival the Mile High collection in grade. Although it predated CGC by a few years, the collection's breadth and depth led collectors to quickly acknowledge it as a pedigree. 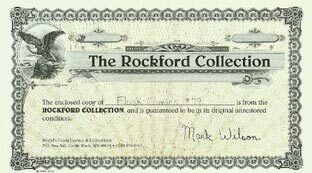 An initial public sale and easy identification have also perpetuated their popularity, although there are many unidentified Rockfords still floating in the market. The Selkirk collection consisted primarily of Golden Age, and surfaced about the time CGC opened their doors in 2000. A sample of from this collection was first sold on eBay when owner Tracy Henning from Washington state decided to test the waters for his "older comics." The collection consisted of almost 500 comics from the early '40s to early '50s with a wide mixture of genre and publishers. Many short runs were present from DC (Batman #3-#27, Detective, Superman) and Timely (All-Winners, Cap, Torch, Subby and Young Allies), as well as Fawcett, Nedor and Quality. The collection also contained many crime and Dell/Fawcett photo cover westerns, but surprisingly no horror or sci-fi. Though few people have heard about this collection, the condition of the books was impressive enough for CGC to seriously consider it for pedigree designation. The Sherwood Collection is a little known and a very mysterious collection of comics originating from the Philadelphia suburb of Sherwood. It was amassed by a gentleman in the 1940s and sold off in pieces. This original owner contacted Phil Weiss of Long Island, NY in 2000 to auction a few of the books, which produced such good results that he kept re turning with more books to auction. After this trend continued for a couple of years, Phil realized the collection was not only larger than he realized, but the quality of the books was consistently exceptional. He gave the collection the Sherwood name, and began listing them as such in his auctions. After a few years the original owner stopped submitting comics for auction. Phil's attempts to contact him met with no response. What happened to the man is a mystery, as well as whether he had more comics to sell. 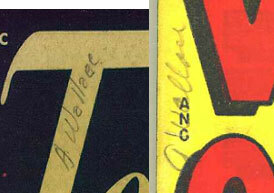 Either way, he left behind a substantial collection of over 1000 gorgeous Golden Age for collectors. Similar to the Mile High collection setting a new high mark for '40s comics with their unparalleled condition, the Spokanes shattered collectors' long-held expectations of quality for '50s books. Until that point, it was generally assumed that comics from this decade would never surface in grades higher than 8.0, and with pages better than off-white. Atomic Age comics have always been notorious for their low quality print runs and deplorable grades. In 1998 the collection, which originated from Washington State, surfaced for sale in New Orleans, LA. Numbering slightly over 1,000, the books were blindingly white, and even more incredible, they appeared structurally perfect. To top it off, the main genres present were horror and sci-fi, which happened to be the red hot in the market at that time. Deep runs of Batman were also present. Mark Haspel was the initial buyer, walking away with almost 20% of the collection. Shortly thereafter the rest were purchased by Stephen Fishler and Vincent Zurzolo, and sold through various channels such as CBG and CBM. Although Spokanes rank sixth in overall grade, it is widely accepted as #1 for the Atomic Age (higher ranking pedigrees from the '50s, like Gaines and Crowley, focus on only one publisher). Spokanes also rank in the top three for page quality. Many collectors may have heard the Toledo pedigree name being bandied about, but few realize how immense this pedigree really is. It originally surfaced in 1980 when Kirby Tardy of Tardy's Collectors Corner in Grand Rapids, MI was contacted about a huge Golden Age stash of comics in Ohio. The caller was not the original purchaser of the collection; it was bequeathed to him when he was a young boy (way back in 1948) by an artist who had bought the comics as reference material for his trade--similar to why Edgar Church amassed the Mile High collection. The artist continued buying comics through the early '50s, giving them to the boy as each pile grew. Eventually the comics stopped coming, but the boy never threw his collection out. By 1980 he realized the value of his collection and began using the books to pay bills as needed. Once or twice a year (usually Christmas and tax time), he would contact Kirby and sell him only a handful of books at a time. This relationship continued for 13 years, with Kirby always wondering how big the collection truly was. 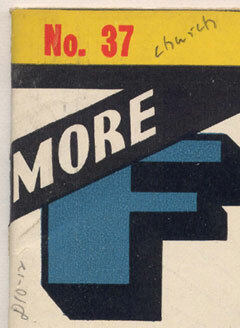 Ultimately he bought over 2000 comics, which stretched back to 1940 and averaged VF in grade. The Toledo Collection can stand up against most pedigrees when the full contents of the collection is presented. Thanks to Tardy's diligence in documenting 13 years worth of purchases, the pedigree book will contain his vast list, and the Toledo collection may finally receive the recognition it deserves. Like the Okajima collection, WW II serves as the backdrop of this pedigree. It's been reported that after a year of collecting comics, Tom Reilly was drafted into the military, but asked his folks to keep buying for him while he was gone. 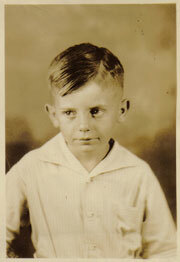 Tom was reportedly killed in a kamikaze attack near the end of the war, at which time the parents had stopped buying his comics. His room was sealed up for years until the decision was made to sell the books in the early '70s. Retroactively designated a pedigree after the concept took hold in the '80s, the San Franciscos are one of the three oldest pedigreed collections (the other two being Cosmic Aeroplane and Kansas City). But no original list was initially made, and the collection was broken up and disbursed far and wide among collectors in California. As a result, it has been very difficult to ascertain the true depth and breadth of this pedigree. Examples of the penciled "G" code, the famous name stamp, and arrival date stamps. Tom Reilly's collection has long been regarded as second best behind Edgar Church's Mile Highs. Bone white pages, spectacular colors, and structural superiority all lend credence to that assumption. In addition, the famous (and indecipherable) Reilly name stamp found on many back covers has allowed the gradual rediscovery of these books over the years. Estimates of the collection's size have gone as high as 5,000, although to date CGC has graded less than 200, a much smaller percentage compared to other graded pedigrees of similar size. The Twilight collection's namesake has a kindred relationship the Cosmic Aeroplane and Mile High pedigrees in that all three were named after the stores that brought them to prominence. 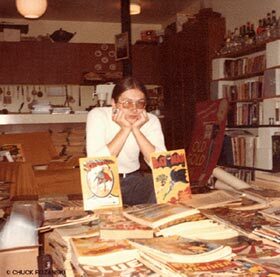 In the summer of 1995, Bob Gray of Twilight Books and Emporium in Syracuse, NY had one of his regular science fiction customers approach him to appraise his childhood comic collection. Trying to be pleasant, but realizing it was likely going to be more effort than it would be worth, he reluctantly made the trip to see the books--only to find 600 dazzling copies of Golden Age comics. Included were near complete runs of Batman #1-#59, Detective #27-#161, and World's Finest #1-#30 (including both NY World's Fair issues). There were even a handful of Timelys that included a nice copy of Marvel Comics #1, as well as several other keys. Although many early issues were in low grade, the later issues were the nicest Bob had ever seen. They rank in the top 25% of the 45 CGC graded collections here. Bob Gray realized he could not afford such a collection, and so he offered his services to broker the books on a national level. He contacted numerous dealers in the Overstreet Price Guide to make closed bid offers on the entire collection. The high offer came in at $274,000 from a team effort between Metropolis and Four Color Comics, who in turn marketed the books through their catalogs. A certificate of authenticity accompanied all books. The Van Buren collection contains two of the most interesting points found in all stories behind a pedigree. The first is that they were amassed by a direct descendant of the United States' eighth president, Martin Van Buren(! ), and the second was how this descendant's comic collection eventually found its way out of the house. One winter day in New York in 1997, a jogger noticed a house near his path that was on fire. He called 911, but unfortunately it was too late for the occupant, who succumbed to the flames. The firefighters, while trying to distinguish the blaze, had pitched piles of flammable paper out into the snow. Within the piles were stacks of high grade Golden Age comics, which sat in the snow for a few days before being rescued. A local dealer from Connecticut named John Grosse was ultimately contacted by a handler of the estate, who bought the comics and brought them to market. The Van Buren Collection consisted of mostly mainstream superhero comics from the early to late 1940s. DC, Timely, Nedor, were all present. Most issues appeared structurally unread and would have likely been accepted as a pedigree if not for the number of the books that sustained water damage from either the fire hoses or the snow. A number of these books did survive unscathed, and except for some smoky odor, they grade in the VF to NM range. One of the most recent pedigrees to surface, and one of the highest ranked on some of our lists, the Vancouvers make up in grade and page quality what it lacks in depth and range. It surfaced on eBay in 2003 after a deal to buy the entire entire collection fell through. It didn't sell there, although the initial interested party ended up buying the collection afterwards. Since then, only a few of the books have been released into the market. Running the gamut of genres from the '40s and '50s, the Vancouver collection is a plethora of single issues, ranging from the obscure (Tally-Ho) to the popular (Namora #1, CGC 9.8). These books exhibit an unparalleled whiteness, thanks in part to the cool climate of Canada in which they were stored until just four years ago. This collection came to prominence during the early ‘90s through Jerry Weist's Sotheby's auctions when the pedigree fad was beginning to take hold on the market. In fact, the collection had been selling piecemeal for years prior to the first Sotheby's sale, beginning in 1984. In it were full runs of ‘50s material, most prominently horror and sci-fi, and full runs of early Silver Age titles. Amassed by a comic fan who diligently stored them in a cool, dry environment (hence the remarkable whiteness of the books), the White Mountains were one of the first major pedigrees to represent the Silver Age, scrapping the notion that only Golden Age collections could be considered for pedigree status. After their introduction through Sotheby's, it wouldn't be long before other Silver Age pedigrees, such as the Pacific Coast, Curator, Western Penn, and Mohawk Valley would surface. 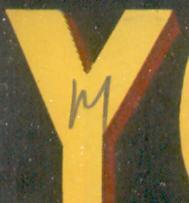 The later white mountains often exhibit the last two digits of the year, written in pen near the issue number. The first page will also have a date written or stamped. Williamsport, PA is known more as the home of the Little League World Series than for a place where classic comics can be found. However, Jack Juka found the "mother lode" of comics there. After buying at a local convention what he called the nicest pair of Captain America #78's he had ever seen, Jack was informed that this was just the tip of the iceberg. This collection, being brokered by dealer and comic shop owner Joe Figured, contained over 3,000 total comics from the start of the 40s to the end of the 50s, most of which were bought off the newsstand. Digging deep into his retirement fund, and with the support of his wife Julie, Jack finally struck a deal for what he would later call the Williamsport Collection. Although the collection contained over 3000 comics in various grades, it was the full runs of Batman and Superman that make this collection stand out. No other Golden Age pedigree contains complete runs of these titles past #100, and none possess the high grades found in the Williamsport collection. To put it in perspective, almost half of the highest graded copies for 1950's Superman and Batman issues on CGC's census are held by the Williamsport copy. One of four pedigree collections to contain all #1 issues, the Windy City is by far the largest, numbering over 2000 comics. It also covers a span of time nearly unparalleled in pedigreed collections, running from the '30s up through the '60s. Even the sale itself was eight years in the making, causing Gary Colabuono, the top bidder for the collection, many a sleepless night. Nearly every #1 issue imaginable is in there, such as Marvel Comics #1 (CGC 9.0), Captain America #1 (CGC 8.5), Batman #1, Flash #1, Captain Marvel #1, All-Winners #1, Daring Mystery #1 and Whiz #1. But there was no copy of Action #1, the ultimate key issue conspicuously absent from all but three of the 45 pedigreed collections covered here. Just like the various titles represented in the Windy City collection, so are the grades of each book. Many were bought second-hand by the owner, Andy Wallace (whose name appears on nearly 1/4 of the comics), an introverted postal worker who lived with his sister. Because the collection entered the market in 1986, long before the pedigree concept had become part of the hobby's landscape, most of the books made their way into private collections anonymously. CGC has only graded slightly more than 50 Windy City copies to date, a paltry 3% of the overall collection. Like the Okajima and Cosmic Aeroplane pedigrees that were assimilated without recognition, unidentified Windy City copies could be sitting in your collection right now.